Everyone deserves high-quality and affordable health care. But right now, our health and well-being is under attack by Senator Mitch McConnell, Senator Rand Paul and Governor Matt Bevin. They are using their powerful positions to unravel health care laws and programs that have helped nearly 500,000 more Kentuckians get health coverage since 2013. Sen. McConnell remains determined to eliminate the Affordable Care Act – even though he has failed so far – and take away health coverage for 22 to 32 million people, including hundreds of thousands of Kentuckians. Republicans in the U.S. House and Senate are proposing severe changes to the Affordable Care Act via their tax cut legislation. And Governor Bevin has proposed a complicated new set of rules that would shove 95,000 people off the state’s Medicaid program, limit dental and vision coverage for many more, and make it much harder for Kentuckians to qualify for Medicaid. Kentuckians deserve so much better. The GOP is in negotiations to pass a final version their tax legislation which may inclue massive cuts to the Affordable Care Act. Urgent actions are needed to stop these attacks and protect affordable health care for all Kentuckians. Please visit our action page on the tax bill to find out the latest information and ways to take action. Bev May is a KFTC member and Registered Nurse in Floyd County. She explains how the Affordable Care Act benefits the families and the economy of Kentucky’s 5th Congressional district. Megan Algie of the Southern Kentucky Chapter shared her story of being impacted by Medicaid expansion to encourage folks to get involved. Share out Megan’s story, and create your own to share, too! A story from WCPO about Mandy and Missy, two KFTC members and business owners in Covington, on the importance of the Affordable Care Act. Note these infographics are for the Affordable Care Act (ACA) and the House GOP bill (AHCA) dismantling the Affordable Care Act. Sign up below to stay connected to this important work. We will keep you informed about upcoming actions you can take locally and online to fight for affordable, quality health care for all people. In June, Kentuckians held the public hearing on Congressional health care bills that Senator Mitch McConnell has refused to hold. Life-and-death decisions about health care should not be made in the dark, in secret, without public input. Our voices must be heard. That’s why members of KFTC organized the People’s Emergency Health Care Hearing. During this event, which broadcast live for 25 straight hours on Facebook, more than 140 Kentuckians from Pikeville to Paducah shared their powerful health care stories and concerns. Tens of thousands watched the live broadcast, and many contributed their own comments and stories. You can watch the entire hearing on Facebook using the links below. Note: We had some technical difficulties during our first hour, so we are not able to link to it here. 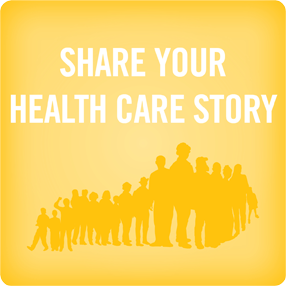 Let us know how you or your loved ones are impacted by our health policies. Do you have a pre-existing condition that you worry won't be covered under the Republicans' health plan? Have you benefited from the Medicaid expansion? Has not having insurance caused you to suffer financially or not receive needed care? We will be sharing these stories with Senator McConnell and other elected officials.